Thoughts from a Traveling Tech: Other DUH! Anyone that has been around this blog knows that I have a great deal of fun with food and caterers. They always try to make their little signs informative regarding the food they have in the steam trays. This time is no better. 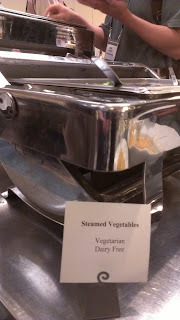 As you can see from the picture to the right, this tray had steamed vegetables in it. Specifically, it had broccoli in it. No cheese sauce or anything. just the broccoli. That's why I had to laugh when I read that this dish was a vegetarian and dairy free. Let's see... broccoli is a vegetable so that would actually make this dish a vegetarian dish. But then who didn't realize that? Now let's address the "Dairy Free". Hmm, sorry, can't see where broccoli without a cheese sauce can begin to resemble anything BUT "Dairy Free". So now we have stepped into the land of Captain Obvious. I know that we want to have clear labeling in case someone has an allergy issue, but sometimes we need to also have a little sanity as well.